There has been a Jewish presence in Soho since the seventeenth century: rate books of the parish of St Anne Soho of the 1750s show Jews living in Rupert Street, Broad Street, Carnaby Street, Great Windmill Street, Greek Street and Berwick Street. In 1761, a first synagogue was established in Westminster, in Great Pulteney, Soho, but shortly thereafter moving to the Strand. A second congregation established itself in Brewer Street in 1810. By the mid-nineteenth century a range of Jewish institutions were established in Soho: Jewish schools were founded in Greek and Dean Streets, amalgamating in 1853 to form the Westminster Jews' Free School at 60 Greek Street, where it remained until 1884, when it moved to Marylebone. The character of the Jewish community in Soho was transformed in the later nineteenth century, with the arrival of Jewish refugees escaping persecution in Eastern Europe, a large number of whom settled in Soho, forming a Jewish neighbourhood. The area around Berwick St market became predominantly Yiddish speaking from the 1890s up to the early decades of the twentieth century. By 1914, Pulteney School in Peter Street, off Berwick Street market, had 440 Jewish pupils; and by 1911, 25% of the pupils at St Anne's School in Dean Street were Jewish. In the 1930s more than 70% of the shops and businesses Berwick Street were Jewish owned. Jewish people became predominate in the quality clothing trades in Soho, working variously as tailors, dressmakers, cloth merchants, haberdashers, milliners, and lace makers. Those involved in these trades commonly worked long hours in harsh conditions. There were also many Jewish butchers, grocers, delicatessens and confectioners. In the wake of the renewed Jewish presence in Soho a number of new institutions were founded. The West End Synagogue (West End Talmud Torah) was established in 1880 at 10 Green's Court, off Brewer Street , later finding premises in Brewer Street and Manette Street , finally moving to 21 Dean Street in 1941. 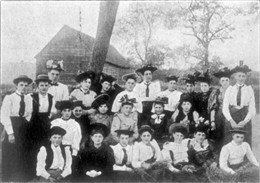 The West Central Jewish Girls' Club was founded at 71 Dean Street in 1893. In 1910 the West End Jewish National Institute (Beth HaSepher) was founded, providing an educational centre, Hebrew classes and synagogue. Beth HaSepher later opened the Shivat Zion Synagogue at 82 Berwick Street, eventually moving to 26a Soho Square. There is little evidence in today's Soho of this once thriving Jewish community. Like similar Jewish neighbourhoods in the East End, there has been a gradual migration to the London suburbs. I found this page very interesting reading and informative. My granfather lived on the corner of Greens Court and Brewer Street (then Little Pulteney Street). Can anyone recommend sources for information other than the census?